Limited lifetime warranty anodized aluminum frame which is highly anti corrosive and lightweight - Aluminum bracket which is power coated easily attaches to toilet. Arm width and height are adjustable. Plastic padded armrests for extra support and comfort. You do not need any tools for assembly. You need to use the existing screws that are on your toilet seat to attach the toilet safety frame. 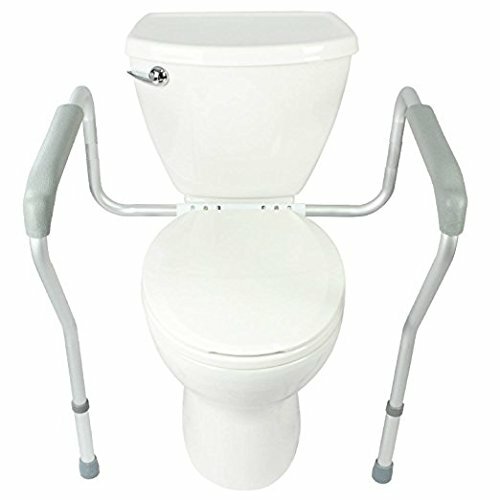 ADJUSTABLE - toilet frame brackets can be adjusted from 18-24" (46-61cm). SAFETY - the sturdy construction of the toilet support rails ensures safety. STRENGTH - made of anodized aluminum, the toilet grab bars are both sturdy and lightweight. THOUGHTFUL DESIGN - Healthline Trading toilet rails provide comfort and security. View More In Toilets & Toilet Aids. If you have any questions about this product by Healthline Trading, contact us by completing and submitting the form below. If you are looking for a specif part number, please include it with your message.